I enjoy baking breads, all kinds of breads. As much as I love eating freshly cooked rice, I believe freshly baked bread right out of the oven is equally delicious. Kneading the bread dough with my elbow grease is one minor hesitation that I face, but I can use my mixer to do the job. However, ever since I learned about the no knead techniques to make crusty bread a few years ago, I am all for no knead breads now. 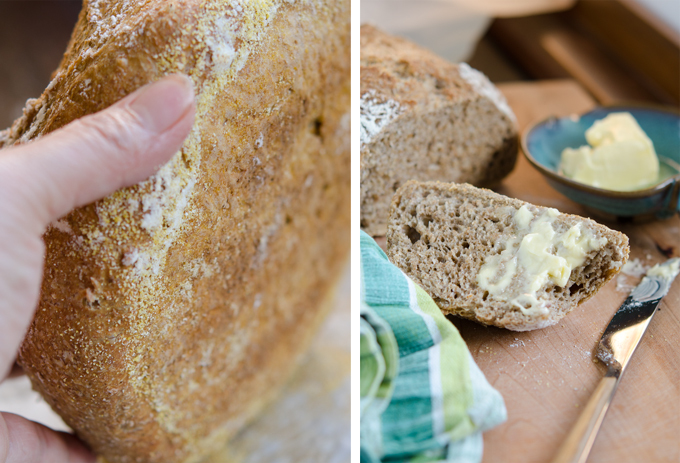 The No Knead Bread syndrome has influenced many home bakers to bake gorgeous artisan breads at home for many years. You can’t mess it up as long as you follow the instructions carefully. The total amount of actual handwork in the process is probably 5 minutes at the most, and the rest is just waiting for nature to do its job. With only flour, yeast, water, and salt… you got a delicious loaf of bread that looks just like the one you see at the bakery. It makes me feel so accomplished! Although I love no knead white bread, I also wanted to add some healthy grain to feed my family with. Here is No Knead Bran Bread! I used wheat bran but oat bran would be nice as well. 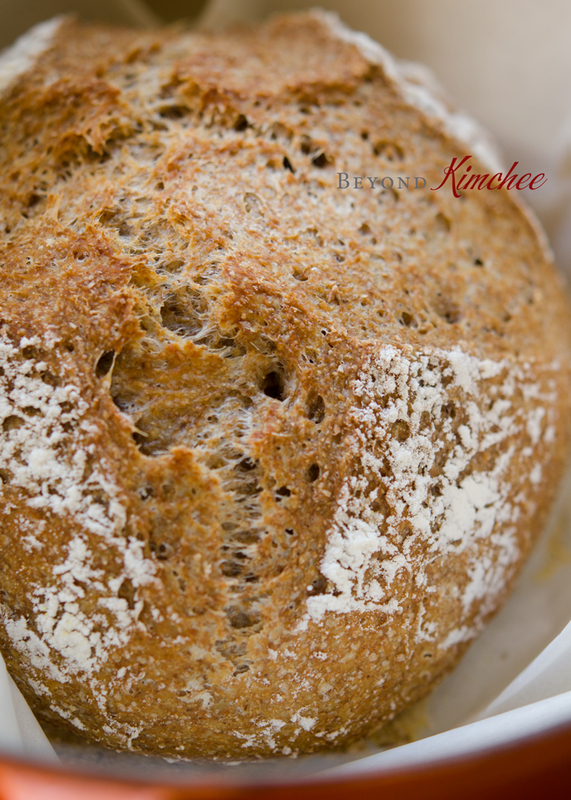 Bran is full of fiber, minerals, and vitamins, it makes hearty wholesome bread that makes you feel good and satisfied. Eat plain as is with a slab of butter or use this bread to make sandwiches. So good! 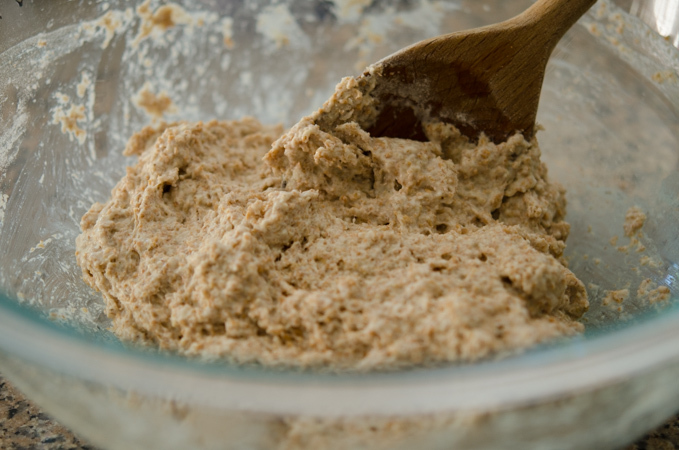 Combine flour, bran, salt, and yeast. I use instant yeast. Let the dough sit at room temperature for 2 hours. You should see some foaming, which means your yeast is alive! Cover with a lid and keep in the refrigerator from 24 hours to 48 hours. Do you see the spiderweb-like texture? That’s a good thing to observe from the risen dough. 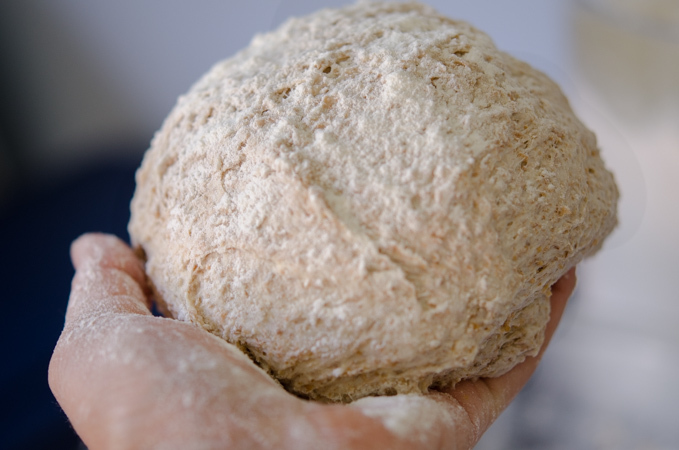 Dust your hand with flour and form the dough into a ball. Try to touch your dough as little as possible. 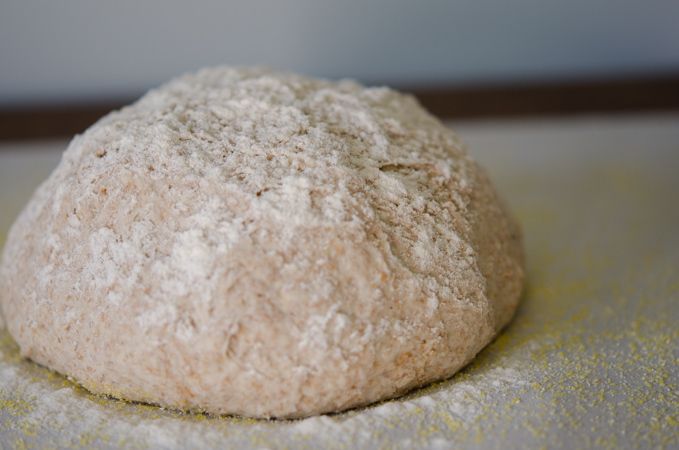 Rest the dough on a parchment paper which has been sprinkled with either cornmeal or flour. Let the dough rest for 45 minutes. No need to cover! Put some slits in it. Flop the whole thing in a preheated hot dutch oven. I heated my Le Creuset oven when I preheated the oven. The oven temperature is about 450˚F, very hot! Be very careful when you pull out the pot to add the dough! Cover with the lid and let it bake! The crust is very crisp and the crumbs are so soft… I just have to slob some butter on to enjoy my warm bread. So good and satisfying! A simple loaf of good bread brings joy to me. Good food, good people, and a good time… that’s what we are all looking for. Hope all of you are having a great time! 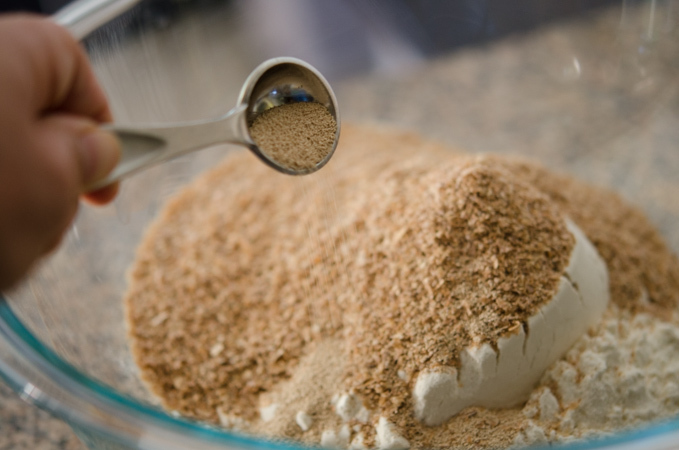 Combine all the ingredients in a large mixing bowl and mix well with a wooden spoon. Cover and refrigerate for 24 hours at least. Dust your hand with flour and take the dough out of the bowl. 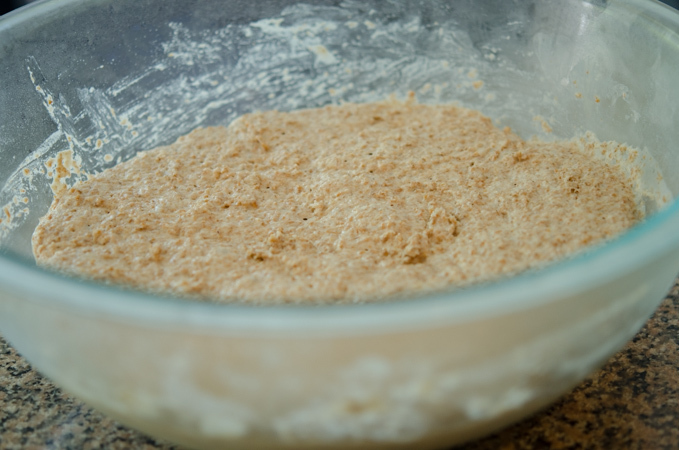 Gently pull the dough to form a bowl. Do not overwork the dough. 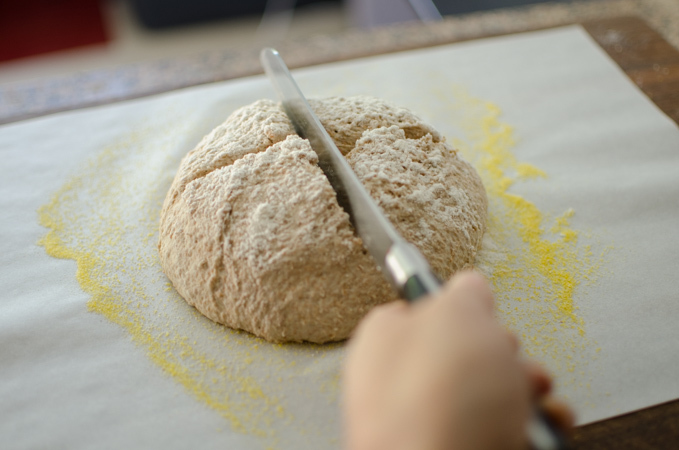 Place the dough on a parchment paper which has been dusted with flour or cornmeal. Dust the top of the dough with flour. Let it rest for 45 minutes. Meanwhile, place a heavy dutch pot with a lid in oven Preheat the oven to 450˚F. 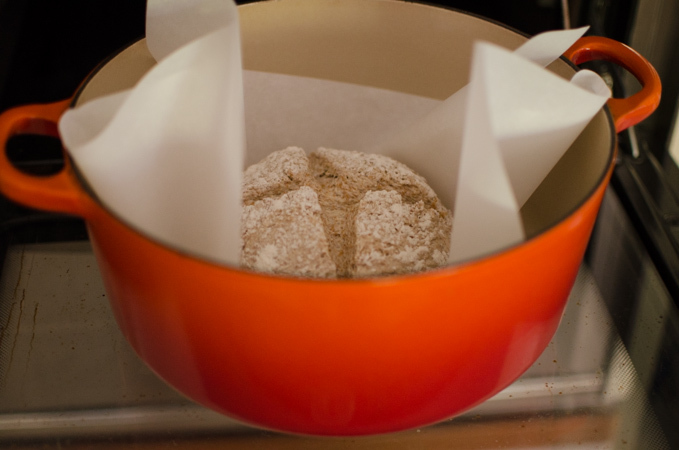 Drop the dough with the parchment paper underneath attached into the hot dutch oven and Immediately cover with a lid. Bake for 30 minutes, then uncover and bake another 20-25 minutes. Take the bread our of the oven. Remove the parchment paper underneath, and let it cool on a cooling rack. Holly, I would like to try the no knead bread but I don't have a dutch pot. Is there any other alternative ? Thanks for your sharing and reply in advance ! Try with a cast iron skillet. Place the skillet in the oven while preheating. Drop the dough with the parchment paper attached underneath onto the hot skillet. Also you can throw a few ice cubs on the bottom of oven, which creates steam that helps to create bread crust to be extra crisp. Thanks for your reply. As you had stayed in Malaysia before , is not easy to get a cast iron cookware here . Hmmm, then another way of baking crusty bread would be the pizza stone. If you don't have a pizza stone, unglazed quarry tiles can do the trick. They have the color of terra-cotta pot. Make sure they are unglazed. 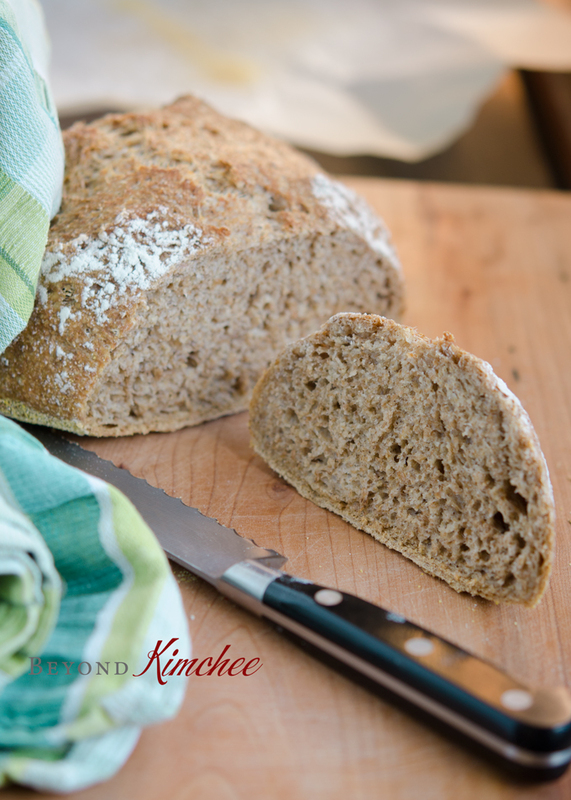 I love homemade bread and especially the no knead kind. I've never made bran bread before and it sounds delicious. 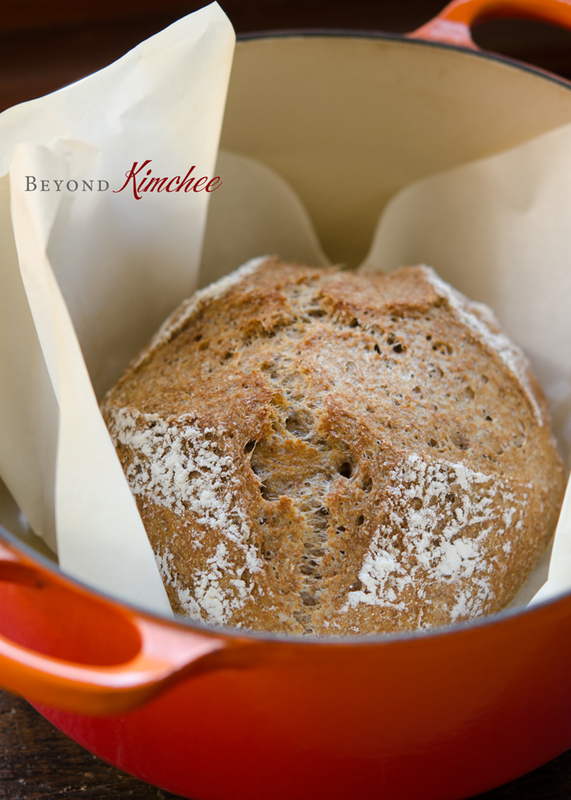 Does it taste much different than just whole wheat bread? I think there is a difference in taste. I don't taste the strong yeast smell that I usually taste in whole wheat bread. 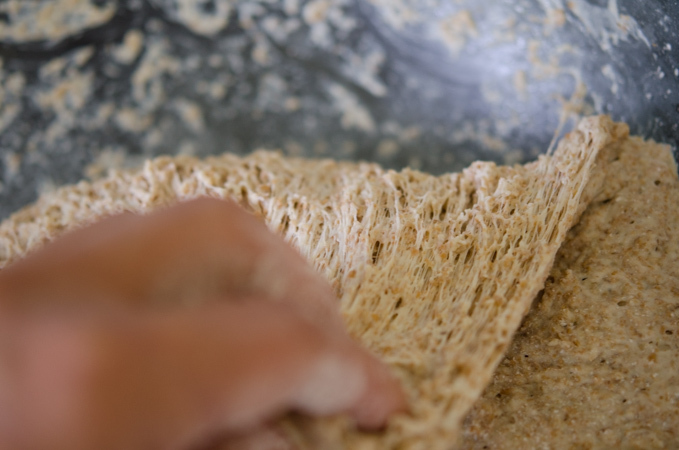 The crumb is coarser in no knead bread, too, due to the longer fermentation. I loved it. Hi Holly, I love your blog. I like Korean food and I have tried few of your recipes, the result are great. I don't have dutch oven, I gave it away to the needy few years ago. Can I use vision glass cook ware? Hi Yuli Yes, you can use glass cookware as long as it is oven safe to 450˚F. Have a fun baking! I made some of this yesterday (I used a pyrex pot to bake it in, BTW, which worked fine) and heavens is it ever delicious. One of the better bread recipes I've run across, so far as taste is concerned. Yum, yum, yum, yum, yum, yum, yum. Just saying. I would say try with 2/3 of the amount of wheat bran.